When you’re moving on from your job, it’s important to maintain the positive relationships you have made at work. One way to make sure your last impression at a company is as good as your first is to take the time to send a farewell message to your coworkers and clients. It's an opportunity to say "thank you" for their help during your tenure with the organization, and to make sure you stay connected in the future. Take the time to thank the people who meant the most to you at work, individually. It's more meaningful to receive a special farewell note written especially for you than it is to receive a generic message sent to everyone. Send personalized individual emails, handwritten notes, or messages via LinkedIn, rather than group messages, so your farewell thoughts are personal. In addition to thanking your colleagues, your messages provide you with an opportunity to share your contact information so you can stay connected. You don't want to lose touch because you don't have a company email account any longer. Begin your email with the subject line, which should include your name and the fact that you're moving on. After your salutation, you can begin the body of your message by expressing your appreciation for the experiences you shared with the person and offering thanks for the support they gave you while you were working together. You should mention how much you will miss your colleague, and make a request to keep in touch. If it’s applicable, offer your assistance in the future. Your personal contact information (email, cell phone, LinkedIn and other social media account links that you want to share) can be included in your closing or, if you prefer, listed with your signature. 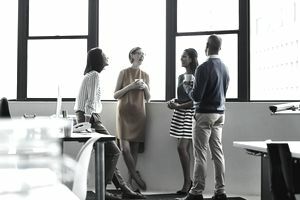 Here are sample employee farewell messages to let colleagues, clients, and your connections know that you are moving on. I would like to personally let you know that I am leaving my position at Jones and Company. I have enjoyed working here and I sincerely appreciate having had the chance to work with you. Thank you for the support and encouragement you have provided me during my time at Jones. I will miss our daily interactions and working on projects with you. I would appreciate your continued advice as I start the next phase of my career. Please keep in touch. I can be reached at my personal email address (sandrasmith@gmail2.com), on LinkedIn at LinkedIn.com/in/SandraSmith or via my cell phone - 555-121-2222. I have news to share! I am leaving my job at Calder Bates on August 1st. Though I will miss working with you and the rest of the team, I am excited to be starting a new position with Jones Mathias and Company in September. I very much appreciate the support and friendship you have provided me over the years. I hope we can stay in touch even though we won't be working closely together. My personal email address is madi.genovese@email.com and my phone number is 612-646-2424. I believe we are already connected on LinkedIn.